Central and southeast Australia continue to suffer under intense temperatures, which in some areas reach 116°F (≃ 47°C). Cows and pastures are suffering and the disappointingly low milk production is crimping manufacturers’ schedules. New Zealand milk production continues to be strong and improved +4.4% in December. Manufacturers are increasingly working to assure adequate low season carryover stocks are in place for June, July and August, while also finalizing good sales opportunities for the near term. Butter prices in Oceania are stronger. Lower milk and cream supplies will be available in coming weeks and months. Early year demand is active. Butter Exports from New Zealand increased (+ 7.8% in the period January-November 2018), in particular to China (+ 28%) and to Australia (+ 26.6%). Prices for SMP in Oceania firmed. SMP production has begun a seasonally normal decline and this is a contributing factor to price firming. Another factor is the milk draw from WMP manufacturers to maintain as much WMP production as they can. Buyers are also apprehensive about possible SMP supply tightness overall, also due to the recent rapid drawdown of EU intervention SMP. Exports declined both for Australia (-1.2% in the period January-November 2018) and for New Zealand (-11.3%). Cheddar prices firmed, following the positive price direction of other Oceania dairy products. Production is continuing according to the manufacturer plans. After filling contractual obligations, some milk, which could be accommodated by Cheddar plans, may transition toward powders, which are considered more profitable right now. The primary Cheese export destination for New Zealand and Australia is Japan, which is significantly increasing its purchases from EU-28 and from Oceania. WMP prices increased. Most scheduled Q1 2019 production has been committed. 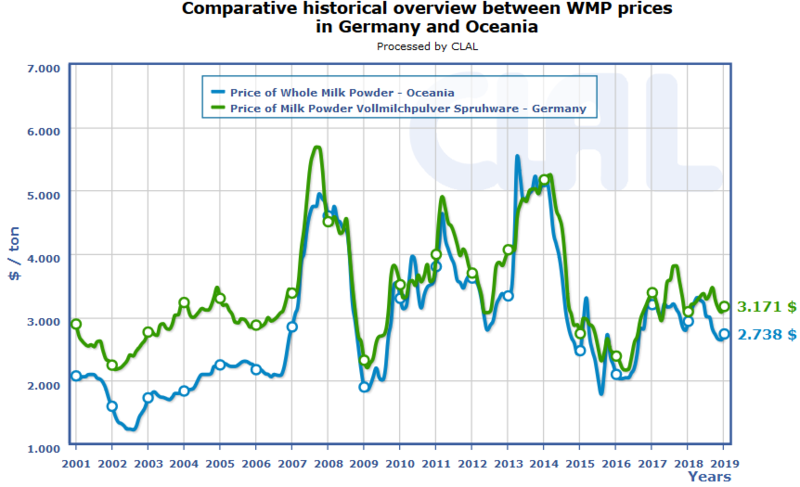 WMP remains the default priority Oceania dairy product because margins are typically good. New Zealand WMP exports in the first 11 months of 2019 are slightly up, reflecting higher demand from China and Algeria. Australia’s exports increase: in addition to China, there is a strong interest from Thailand.